Realising the need for better passenger accommodation, Reinhold Platz, in charge of the factory at Schwerin now that Fokker was in Holland, abandoned development of the F.I and designed instead the F.II prototype. A parasol monoplane with open cockpits for pilot and passengers, like the F.I (V 44), the F.II (V 45) was built at the Fokker works at Schwerin in Germany, making its first flight in October 1919 and receiving the German civil registration D-57. The decision having been made by Fokker to transfer his activities to the Netherlands, the F.ll prototype was flown out of Germany illegally by Bernard de Waal on 20 March 1920. The thick-section cantilever wooden wing, intended originally for the F.I, was bolted to the top of the F.II's fuselage, which was of rectangular section and tapered in width to the strut-braced horizontal tailplane. There was no fixed fin and the rudder was of relatively small dimensions. Four passengers were accommodated in a cabin beneath the wing, while the pilot and a fifth passenger were located in an open cockpit immediately forward of the cabin. 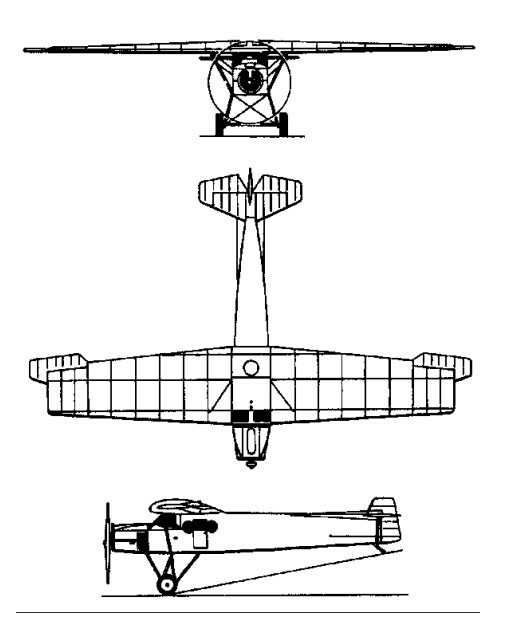 The landing gear of the F.II was of cross-axle type with rubber-cord shock absorbers. The F.ll proved to be one of the first practical passenger transport aircraft in the world and some 30 were built, most being constructed under licence by Grulich in Germany, but several being produced at Netherlands Aircraft Factories in north Amsterdam and at Fokker's new Veere factory. It is believed also that three series machines were completed at Schwerin. The Fokker-Grulich F.II, of which at least 19 were built, had an improved cockpit layout, redesigned cabin windows and strengthened landing gear. Ing Karl Grulich was technical manager of Deutsche Aero Lloyd (D.A.L.) and his version of the F.II was flown by that airline. The wings of the Grulich F.II were built by Albatros and the fuselages by D.A.L., who also carried out final assembly work. Veere- and Schwerin-built F.IIs had BMW IIIa engines, but the Grulich versions had 186kW BMW IVs. Most of the Grulich aircraft were re-engined subsequently with the 239kW BMW Va and given the new designation F.IIb. The three Schwerin-built F.II series aircraft were registered in the Free City of Danzig and used by the Deutsche Luftreederei airline. Dutch-built F.IIs flew from 1920 to 1927 with the national airline KLM and two were sold to the Belgian airline SABENA for a service between Brussels and Antwerp. One Dutch-built F.II had a 179kW Armstrong Siddeley Puma engine and one was flown briefly with a BMW IV. Longest-lived were the Fokker-Grulich F.IIbs. Taken over with some F.IIs by the newly-formed Deutsche Lufthansa in 1926, 10 still remained in service on feeder routes linking Cologne with Aachen, Essen, Krefeld and Mulheim in the Ruhr in 1934.